Brighton and Hove (/ˈbraɪtən ən ˈhoʊv/) is a city in East Sussex, in South East England. At the 2011 census, it was England's most populous seaside resort with a population of 273,400. The towns of Brighton and Hove formed a unitary authority in 1997 and in 2001 were granted city status by Queen Elizabeth II. 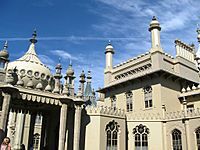 "Brighton" is often referred to synonymously with the official "Brighton and Hove" although many locals still consider the two to be separate towns. Portslade-by-Sea was added to Hove in 1974 under the Local Government Act 1972. Both Brighton and Hove became non-metropolitan districts of East Sussex. On 15 October 2004, Brighton and Hove was granted Fairtrade City status. Elections are held every four years, with the last elections occurring on 7 May 2015. Brighton and Hove was the first ever council in the United Kingdom where the Green Party were both the largest group and led the council (from May 2011 to May 2015). In 2013 the council was obliged to finalise single status across its workforce, resulting in a strike of its refuse collectors and street cleaners. Their council reformed their allowances to equalise them with other staff at the organisation conducting similar work. The Leader of the Council and Labour minority administration since May 2015 is Councillor Warren Morgan (Lab Co-op). The mayor of Brighton and Hove for 2016-2017 is Councillor Pete West. Geoff Raw is the current chief executive. In 2012 it was revealed that the Brighton and Hove unitary authority has been permanently banned from accessing information from the Driver and Vehicle Licensing Agency. This information is normally made available to local authorities for purposes such as enforcing parking fines, but access can be withdrawn if they are found to be misusing the service. The Big Brother Watch organisation, which obtained the information about the ban under a Freedom of Information request, claimed that "the public are right to be worried that their privacy is at risk across a range of government services." The first census of Brighton was in 1801. The resident population of Brighton and Hove at the 2011 census was 273,369 persons, 50% male and 50% female. The 2011 census found the ethnic composition of Brighton and Hove to be 89.08% white (80.48% white British, 1.38% white Irish, 7.21% other white), 4.13% Asian (1.10% Chinese, 1.10% Indian, 0.50% Bangladeshi, 1.43% other Asian), 3.81% mixed race (1.54% mixed black/white, 1.23% mixed white/Asian, 1.05% other mix), 1.53% black and 0.80% Arab. The 2011 census found the religious composition to be 42.90% Christian, 42.42% nonreligious, 2.23% Muslim, 1.00% Buddhist, 0.98% Jewish. 1.66% were adherents of some other religion, while 8.81% did not state their religion. In the 2001 census, Brighton and Hove had the highest percentage of citizens indicating their religion as Jedi among all principal areas of England and Wales. The economy of the city is service-based with a strong emphasis on creative, digital and electronic technologies. Tourism and entertainment are important sectors for the City, which has many hotels and amusements, as well as Brighton Pier and Shoreham/Portslade Harbour. The United Kingdom Census 2011 showed a substantial fall in the proportion of the population claiming Jobseeker's Allowance or Income Support, from 10.1% of the resident population in 2001, to 4.5% of the resident population in 2011. Brighton and Hove Facts for Kids. Kiddle Encyclopedia.